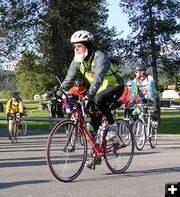 The 12th annual Scenic Tour of the Kootenai River is in full swing here in Libby, bringing bicyclists from Montana, Idaho, Washington, Utah, and as far away as Canada and Belgium. 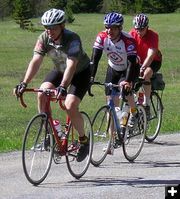 The hugely-popular event is a fund-raiser for the local chapter of Habitat for Humanity and is limited to 350 riders each year. 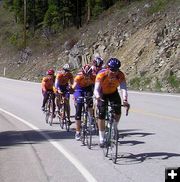 Riders were treated to beautiful blue skies and warm weather with temperatures in the 70s. We took hundreds of pictures and haven’t had a chance to go through them all yet, but here is a sneak peek from Saturday’s ride. 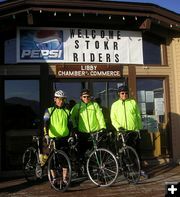 Today, Sunday, riders will do a shorter 37-mile loop ride that will take them east along the Kootenai River to Libby Dam and back to town. We’ll post more pictures and a complete story after the event is done. 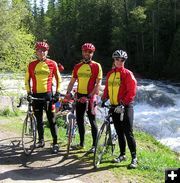 Great Divide Cycling Team Great Divide Cycling Team riders, from Helena, Montana, pose at Yaak Falls. BSA Troy Troop 1924 Jeffrey, from Troy Boy Scout Troop 1924, helps out at the Sylvanite School Food Stop #2. Having a great time Sharon and Curtis Rytz from Calgary, Alberta. This is Curtis’s 4th STOKR. "We certainly look forward to the ride each year."